The Cricket in Times Square is the third book I read for literature studies in 4th grade. 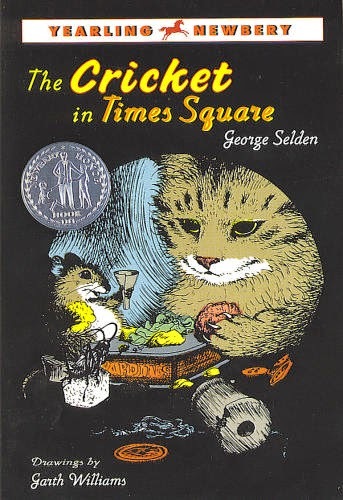 The Cricket in Times Square is about a cricket named Chester, a mouse named Tucker, and a cat named Harry. Tucker and Harry are good friends and live in the Times Square Subway Station. One day, they hear a chirping noise and a small boy named Mario goes and finds Chester. Mario then cleans off the cricket and makes him a little bed out of a matchbox and tissues. He feeds the cricket some chocolate and ask his parents if he can keep him. His parents say yes. Mario takes Chester to get a small cage at the Chinese store and puts him in the newsstand. That night, Chester meets Tucker and Harry. They become friends. One month later, they have a party. Chester plays music and Tucker likes it so much he starts dancing. He dances so much that he knocks over a box of matches. The newsstand lights on fire and Chester jumps and sets off the alarm clock. People open the newsstand. The three animals jump out and the people put out the fire. Mario's parents come and say that Mario must get rid of Chester. They try to sell as many papers as possible while Chester plays Mama's favorite song. Mama Bellini then says that anybody who can play her favorite song that well can stay. Chester becomes a star because of his music but retires when it puts too much pressure on him. He then gets ready to go home. I liked this book because it had a lot of adventure in it, especially when Chester turned from a regular cricket into an awesome musical animal.